All the fighters slated to participate in tomorrow night’s “The Ultimate Fighter 12 Finale” tipped the scales today inside the The Pearl at the Palms Casino Resort in Las Vegas, Nevada. 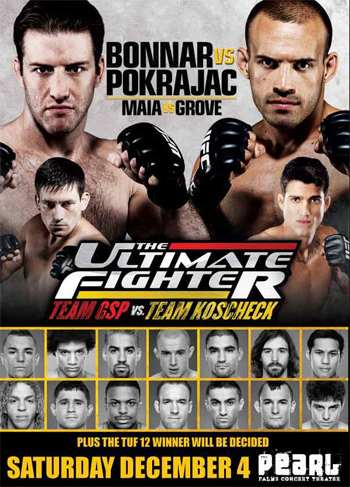 Original TUF cast member Stephan Bonnar will now CO-HEADLINE the freebie fight card against Croatian Igor Pokrajac. Bonnar recently ended his three-fight skid by stopping Krzysztof Soszynski at UFC 116. Michael Johnson will battle teammate Jonathan Brookins for the highly coveted six-figure UFC contract. Both 155-pounders will represent Team George St-Pierre in the finals. The lightweights were scheduled to to open for Bonnar/Pokrajac, but the switch was announced during Friday’s weigh-ins. Nam Phan represented the only member from Team Josh Koscheck to make it to the final four. He dropped a close split decision to Johnson in the tourney’s semifinals. Spike TV will broadcast “The Ultimate Fighter 12 Finale” at 9PM ET/PT.